The photo above is of the engine from my Datsun 240Z. I added triple Weber carburetors to it to soup it up a bit. 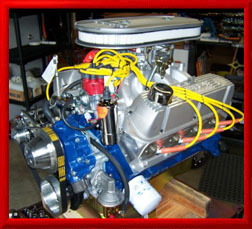 In today's day and age of fuel injection carburetors are not used any more. Internal Combustion Engines ignite and explode fossil or petroleum based fuels in a series of cylindrical chambers housed inside the engine block. Each chamber contains a piston, which is connected to a crankshaft via a connecting rod. On the intake stroke the valve opens to admit the air fuel mixture into the combustion chamber. On the compression stroke the intake valve closes and the piston rises to compress the air fuel mixture. At the top of the stroke the spark plug ignites the air fuel mixture and this pushes the piston down which now imparts this driving force to the crankshaft via the connecting rod causing it to rotate. Once the piston is at bottom the exhaust valve opens and now the piston goes back up to the top again pushing the exhaust gas out. That's why these types of engines are called 4 stroke engines because it takes 4 strokes of the piston to complete one fuel burn, exhaust cycle. (Up-Down, Up-Down) This is the most common type of car engine around and it has been around for almost 100 years already.